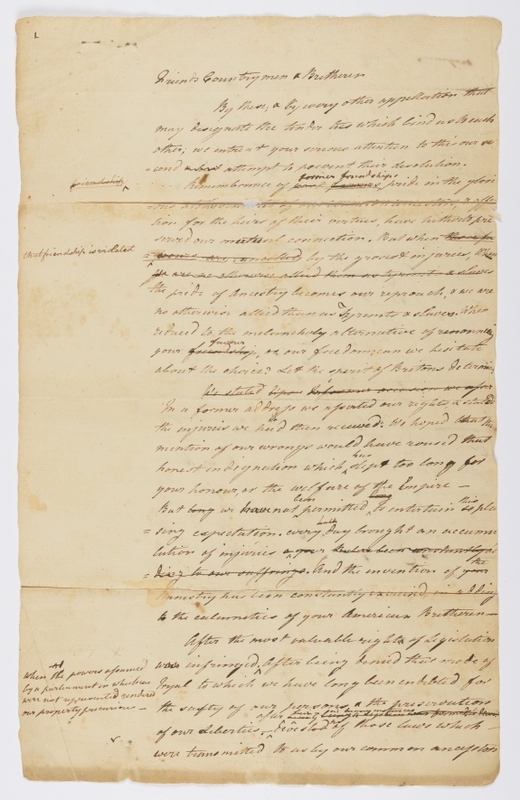 On January 26th, Keno Auctions of New York City sold a highly important and historically significant document entitled ‘Letter from the Twelve United States Colonies, by their delegates in Congress to the Inhabitants of Great Britain.’ After heated competition between several phone bidders in a packed salesroom, the gavel dropped at $912,500 (including Buyer’s Premium), well above its presale auction estimate of $100,000 to $400,000. The winning bid of $912,500 was by private collector Brian Hendelson who, shortly after the auction, said "I am very excited about adding this amazing piece of history to my collection. Â To be able to buy any original manuscript written relating to our independence is an extremely rare opportunity. To have the opportunity to own the original draft of the final plea to Great Britain is even more extraordinary. The only thing I can compare this to would be to own the original draft of the Declaration of Independence”. The price is the highest for any lot sold at auction during Americana Week 2014 in New York.